Haptic Vest is a vest that enables vision-impaired users to experience their surroundings by vibratory actuations on the belly. A person can feel a depth image of what is in front of them. An Asus Xtion depth camera mounted on the chest captures the area in front of a person. This is then translated into PWM values to control an array of vibration motors. Each vibration motor represents a pixel of the downscaled image, and the intensity of the vibration displays how far away on object at this position is. This project was formerly called OpenVNAVI and was developed by David Sanchez. It was later renamed to VibroVision and then to HaptiVest. Besides from the setup for controlling large numbers of vibration motors we also develop a more general toolkit for using multiple sorts of sensors and actuators called YAWN. 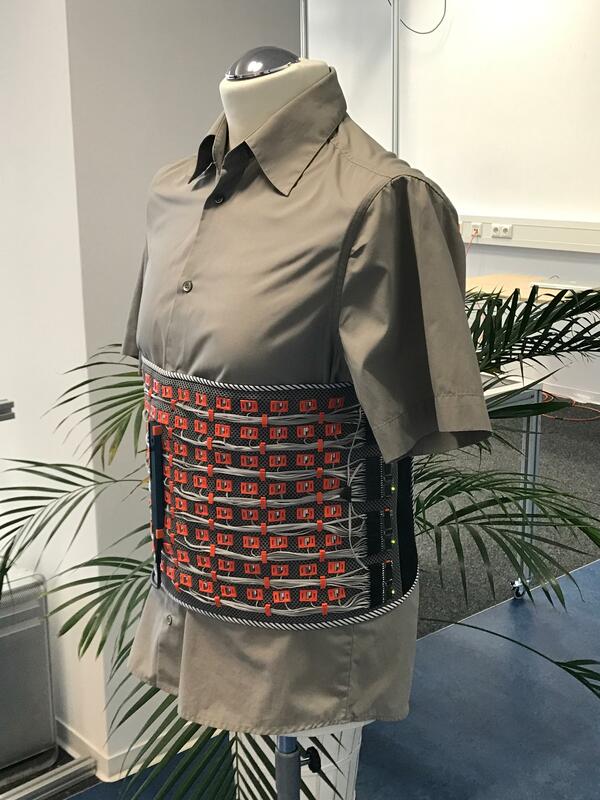 Aug 27, 2017: Haptic Vest at BMBF: We demonstrated our Haptic Vest 2.0 at the Open House Event of the Ministry of Education and Science (BMBF) as one of four examples of the new high-tech strategy of the federal government this weekend. 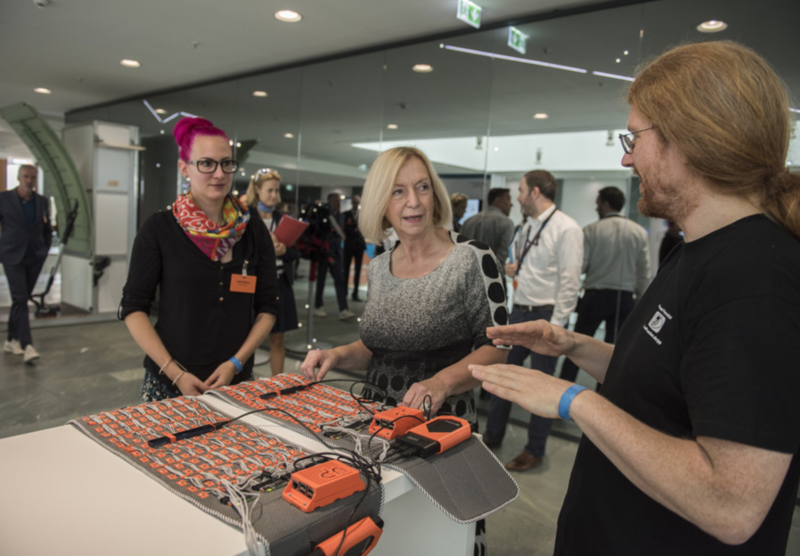 Jan Thar and Sophy Stönner from our lab demonstrated their latest prototypes of the vest to research minister Prof. Wanka (left photo) and numerous other guests. Details in the event reports on the BMBF homepage and on the pages of the Photonics Research Initiative Germany. Jun 13, 2017: Our Haptic Vest 2.0, a wearable vest that renders depth images from a front-facing camera onto the wearer's torso using an array of vibration motors, enabling people with vision impairments to avoid obstacles while walking, was featured in a dedicated TV report in WDR Lokalzeit Aachen today. The report (in German) starts at 14'50" into the program (local cached copy). October 12–18, 2015: Light Cares Exhibition (BMBF). May 9–13, 2016: CHI 2016 Interactivity Demos. August 17, 2016: WiLa Bonn. September 3, 2016: Minimakerfaire Mayrische, Essen. September 30–October 2, 2016: Makerfaire, Berlin. October 14–16, 2016: Makerfaire, Rome. November 5, 2016: Minimakerfaire, Cologne. November 17–20, 2016: Makerspace Messe, Stuttgart. May 6–7, 2017: Make Munich. June 26–29, 2017: Laser World of Photonics. July 5–6, 2017: FAB13 - FabFestival. August 26–27, 2017: BMBF - Tag der offenen Tür. September 13–17, 2017: ISWC 2017. October 13, 2017: COF Digital Day. October 17, 2017: Inklusion von Menschen mit Sehschädigung durch Sport. January 25, 2018: Fabricademy Recitation. March 2-3, 2018: HelpCamp Kamp-Lintfort. Mai 25-27, 2018: MakerFaire Berlin. June 9-13, 2018: DIS 2018. July 27, 2018: Meetup Co-creating Open Hardware for Health & Wellbeing - HAPTIC ORIENTATION. September 14-16, 2018: MakerFaire Hannover. September 21, 2018: COF Digital Day. October 8–12, 2018: ISWC 2018. October 28–31, 2018: CHIPLay 2018. March 2–3, 2019: Make Munich. maybe: Mai 17–19, 2019: MakerFaire Berlin. June 24-27, 2019: Laser World of Photonics. Aderick Krispradhana. HaptiGuard: Sideway Detection Armband for Hearing-Impaired People. Masters's Thesis, RWTH Aachen University, Aachen, September 2018. Jan Thar, Sophy Stoenner and Jan Borchers. HapticPong: Low Resolution Games for Visual Impaired. In Proceedings of the 2018 Annual Symposium on Computer-Human Interaction in Play Companion Extended Abstracts, CHIPlay '18, pages 133–136, ACM, New York, NY, USA, 2018. Jan Thar, Sophy Stoenner and Jan Borchers. HaptiGames - Personally Fabricated for Visual Impaired. In Proceedings of the 2018 Annual Symposium on Computer-Human Interaction in Play Companion Extended Abstracts, CHIPlay '18, pages 137–141, ACM, New York, NY, USA, 2018. Jan Thar, Sophy Stoenner, Florian Heller and Jan Borchers. YAWN: Yet Another Wearable Toolkit. In Proceedings of the 2018 ACM International Symposium on Wearable Computers, ISWC '18, pages 232–233, ACM, New York, NY, USA, 2018. Florian Heller, Jan Thar, Dennis Lewandowski, Mirko Hartmann, Pierre Schoonbrood, Sophy Stoenner, Simon Voelker and Jan Borchers. CutCAD - An Open-source Tool to Design 3D Objects in 2D. In DIS '18: Proceedings of the 2018 Conference on Designing Interactive Systems, DIS '18, ACM, New York, NY, USA, 2018. Jan Thar, Florian Heller, Sophy Stoenner and Jan Borchers. HapticToolkit: Easily Integrate and Control Vibration Motor Arrays for Wearables. In ISWC '17: Proceedings of the 2017 ACM International Symposium on Wearable Computers, pages 249–253,September 2017. Nadine Bergner, Patrick Franken, Julia Kleeberger, Thiemo Leonhardt, Mario Lukas, Mario Pesch, Natalia Prost, Jan Thar and Lina Wassong. Das Calliope-Buch: Spannende Bastelprojekte mit dem Calliope-Mini-Board. dpunkt, Book, July 2017. Max Jodl. Haptic sense - Evaluating the reliability and perception of vibration motor arrays on the human body. Bachelor's Thesis, RWTH Aachen University, Aachen, March 2017. 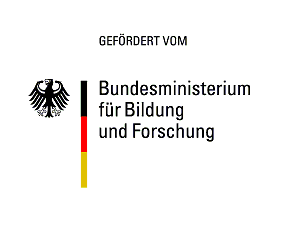 This project is sponsored by the German Federal Ministry of Education and Research (BMBF) as part of their Open Photonics call (Personal Photonics, 13N14065).